Reason #1 to Sell with Buy Owner: No Commissions! With Buy Owner, you pay NO commissions. Period. This means more money in your pocket: you won’t have to pay real estate agents 6% of your home’s selling price, and you could even price more aggressively while still saving money! Think about this: People who use Buy Owner save thousands of dollars simply by choosing to sell their homes on their own. For example, six percent of a $250,000 home is $15,000. With Buy Owner, cut the commission and keep your money. 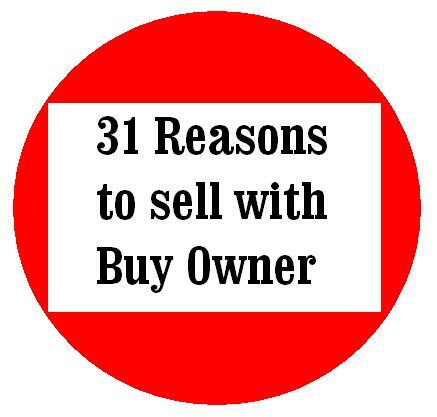 31 Reasons to Sell with Buy Owner! Happy New Year! To celebrate, we’re kicking 2010 off with a series of daily posts in January that highlight reasons to sell with Buy Owner, giving you a total of 31 reasons there’s no better way to sell your home. The series begins this afternoon, so check back here to see what’s in store! Want to be sure you stay up-to-date with the latest news here? You can subscribe to the Buy Owner Blog here, via an RSS reader or through e-mail! On average, how much time do you spend on the Internet each day? According to a poll on the New Business Blog, nearly 65% of Americans spend at least eight hours a day surfing the net. And Business Week claims that 22% of those people are just checking their mail for one to three hours. This means that over half of the people in the United States are online for one-third of any given day! • Web sites are easier to remember. If a prospective buyer is looking for a house, he/she is more likely to remember the name of a Web site than the phone number of an agent. By choosing one of Buy Owner’s online advertising packages, your property will get more recognition, as it is easily searchable on the Internet. Rather than taking the time to peruse through paper listings, a potential buyer can type in a few keywords and check a few boxes to see the types of the houses they want to purchase. And that house could be yours! • Your listing is available 24/7! Your Buy Owner advertisement boasts professional photos of your property, in addition to a virtual tour. This way, possible buyers have 24-hour access to the ins and outs of your home. The only way someone could be able to see a house listed in the newspaper would be to call the listed number to schedule a showing within strict time constraints. With Buy Owner, buyers can see everything your home has to offer any time of day (or night) with the click of a mouse. • Potential buyers get to interact with your property. The most unique feature of online marketing is that it is an interactive medium. As mentioned above, buyers can scroll through photos of your house and take a virtual tour of your home, in addition to reading the descriptive text about your property. With the ability of Buy Owner to provide buyers with more than just textual information, the buyers will feel more confident about purchasing your home than if they were merely looking at a print ad with one photo of the front of your house. Also, if buyers live out of state, they don’t even need to schedule a showing, because they can see everything they need to see right on the computer!